Heidi is 7 1/2 months old here, when she arrived at 8 weeks old off the plane she knew she was home and adjusted immediately into a family of 2 Bengal cats, one house Cat, one Male Belgian age 3, and our teen age daughter. She was house broken quickly very smart. The Veterinarian said she was the healthiest pup that ever arrived for examine, needed nothing. She developed guard and protective instinct’s probably from birth, became Alpha dog right away with the male who adores her. She protects the house, other pets, and is a real sweet heart very affectionate and likes to hug you with a double paw grip, and so stable with all. She recognizes threats, likes it outside more than inside until night fall, she can search like no other and has a bite and hold that would probably win many competitions. I waited 15 months for her and got exactly what we wanted, a dark Mal like Hillie’s appearance the DAM and having the famous Dylan as the sire is just a plus+++. She be awesome as she looks! Having owned a Belgian Malinois before for police work and home protection, I want to thank you for the wonderful addition to our family, our Malinois puppy Maverick. He is a joy! Maverick knew he was “home” within two days of us receiving him. He demonstrated protective qualities within the first week by growling and barking when our back fence gate opened and a friend arrived to meet our pup. His demeanor is perfect; very alert and very smart while being puppy playful and super affectionate. He loves to play ball and chew his abundant chew toys. Maverick socializes and plays well with the other dogs within our extended family. 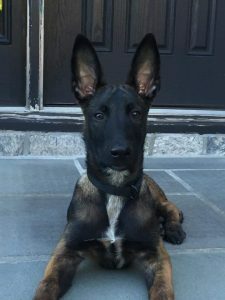 Having raised other puppies before but not a Malinois puppy, there is definitely a difference in the type of and strength in Maverick’s bite….. He will be our home and family protector! It does pay to do ones research when it comes to finding a good dog breeder. You took time to answer all our questions about the prospective parents and your dog breeding history. You kept in touch with us, with photos too, after the litter was born, keeping the information coming on how they were progressing as the weeks passed. Everything you did was much appreciated. 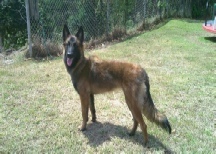 I would recommend you to anyone seeking to own a pure blood Belgian Malinois, for home protection and/or police work. I had malinois before, but this one here is extremely unique her qualities speak for themselves. If you are looking for the best of dogs a breeder has to offer, a malinois from KNPV and PH1 bloodlines is a big deal. We drove to Miami from Boston and the plan was to pick up our new family member and take an International flight to Panama City, Panama. 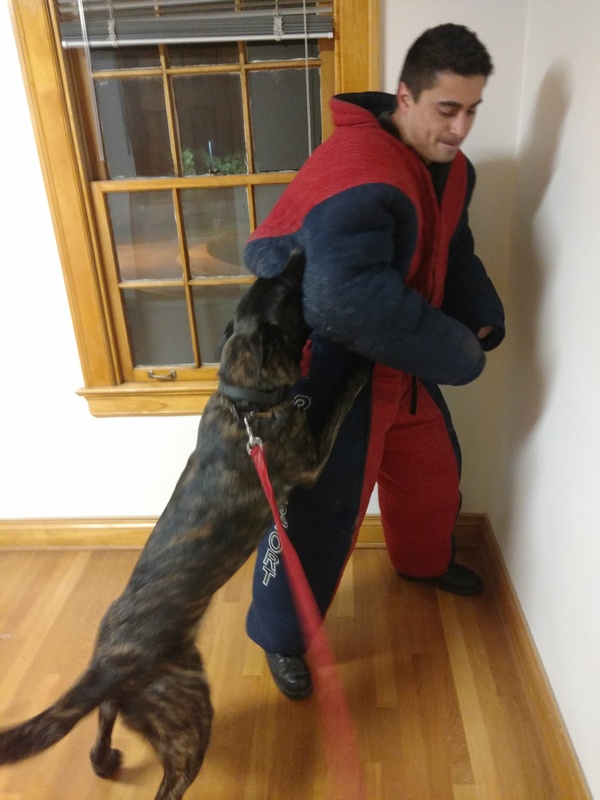 To make along story short there was more paperwork involved than I had realized, but Gus and his wife at Avisa K9 were very accommodating to us the whole time, it was a lot less simple than I had imagined, e.g. department of agricultural, veterinarian documents and vaccinations etc. Both of them were very supportive, we had a very good experience which made our first puppy purchase as a couple, a memorable one. 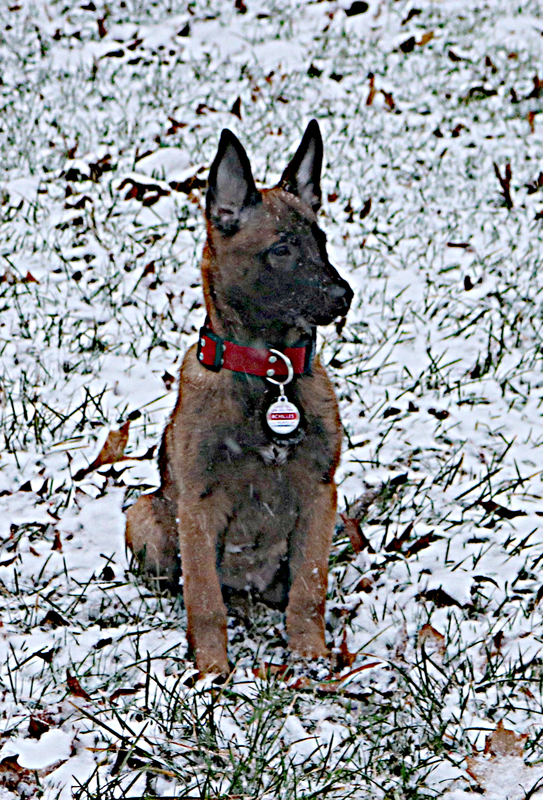 My malinois from Avisa K9, Aria (which my wife calls her “Molly”) is highly intelligent and ball driven, protective at all times being aggressive yet loving, comes from solid European bloodlines and I can expect as she is still growing to become a bigger Malinois. Also the good thing about buying a puppy from Avisa K9 is the peace of mind knowing and seeing both parents of the dogs were on site, which was very cool, scary and satisfying for me (Mother & father were very impressive). Malinois from Avisa k9 have a natural sense of their inborn qualities. She was accurately described as a working dog from proven backgrounds and indeed possesses the traits in their pedigree. My malinois has a protective perimeter she does not let anyone comes too close without a verbal “relax” command, she is always on point, ready and totally committed. Her quality and her excellent bloodline is clearly evidence by her demeanor and natural instinct. It was extremely easy training my malinois using hand gestures and verbal commands, from the time I brought her home “it was like she already knew them”. At 4 months she was already heeling, retrieving and biting. She is the best Belgian Malinois I have ever had. It was a much welcome addition to our family and we are very happy to have her here with us in Panama! Thank you very very much guys. Thanks so much for sending us such a great dog! Granger has been with us for a month and is awesome. She loves our kids and has been going everywhere with us since she arrived. She does everything from 4 am swim practices for the kids to lacrosse games. She has a wonderful temperament, is super smart and is a real joy. 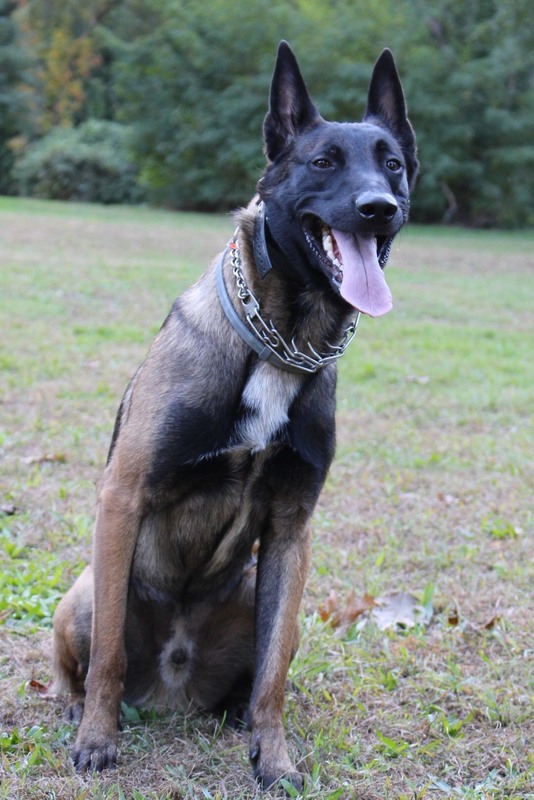 Anyone looking for a Malinois should check out AvisaK9. ‘Hey Gus I just wanted to reach out and let you know Patriot is doing great! What an awesome dog you gave me!’. A very happy customer sending us referrals. Achilles , Boris X Poema Pup. 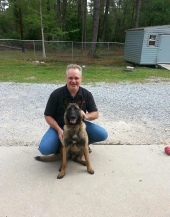 the following is a testimonial/email sent to us from SGT Swarn, Achilles new owner. This is my testimonial; again thank you guys so much Achilles is amazing. When I found Avisa K9 I was currently deployed serving in Afghanistan during Operation Freedoms Sentinel. I did a lot of research and Avisa K9 kept coming up, so upon entering the site I saw Boris and wanted a puppy from his litter. With my luck the closest litter was Boris and Poema due upon my return from Afghanistan. Once I got home I had about 3 weeks to prepare and during this time Avisa K9 kept me informed on my pup (Achilles) with pictures every week and how he was doing. This process was super easy to get the money to them and well worth it. We scheduled a flight for him to be flown to Ohio at the Columbus Airport and it only took me telling them which airport and when they sent him off; he was sent with a picture and an email saying he is en route. When I picked him up, I could already tell he was going to be an amazing pup. He had such a high drive and picked up on sit, heel, down, search, and stay within the first week. I am teaching him a different language as he will be my cadaver working dog; taking him to classes as well as my daily obedience training and exercise instructors telling me he is one of the smartest puppies they have ever met. I can tell that he is going to be quite the worker and he is everything I hoped for and more. Thank you so much Avisa K9 for the easy process. In the picture he is only 9 weeks old; more pics to come. Karem is a very very smart boy! He knows up, sit, down, stay and paw. We are working on bite, work and heal. Another Wonderful testimony from a client! First of all, let me simply say “thank you for sending us “Luna!” Wow! She is amazing! 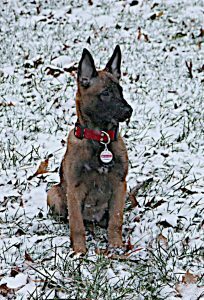 I’m so happy I bought a Belgian Malinois puppy fromAvisak9inc. , rather than someone else. You did everything I asked you to do. The follow-up was great! We received our AKC papers and the price was below what others charge. The quality of our dog is above what others claim to offer. (I’m sure of it). Everyone knows a” working lines” BM. This is what we have. We’ve found a trainer in Los Angeles who trains BM’S for the police. Even this trainer was super impressed with Luna. She’s a rocket ship blasting off into the night! We were told Luna is very protective, fiercely loyal, determined to do things her way! Lol. 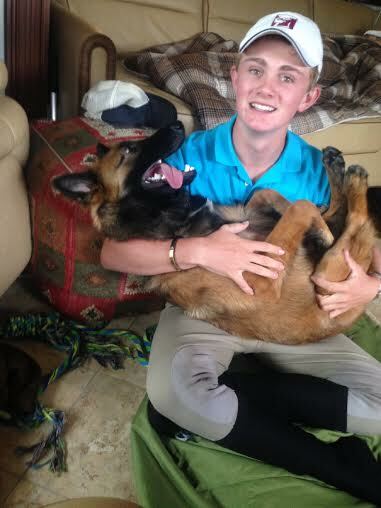 Luna is now in training to become a household and personal protection dog. She’s like a new ferrari, she turns heads around every corner. In fact, I’ve told other law enforcement agencies to call AvisaK9. Moreover, oneday, we expect to purchase a male BM from you. In closing, we’re sending our love and thanks to your family always! I first came to decided that I wanted a malinois when I was 15 years old but after really not knowing where to look I gave up hope on getting a working dog. Once I came to Wellington to show horses for the winter. 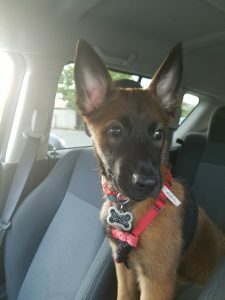 There I met a lady that owned a young malinois from avisa she recommended me to them. So It so happened that there was a litter at perfect age for new homes and I made the trip down to Miami. 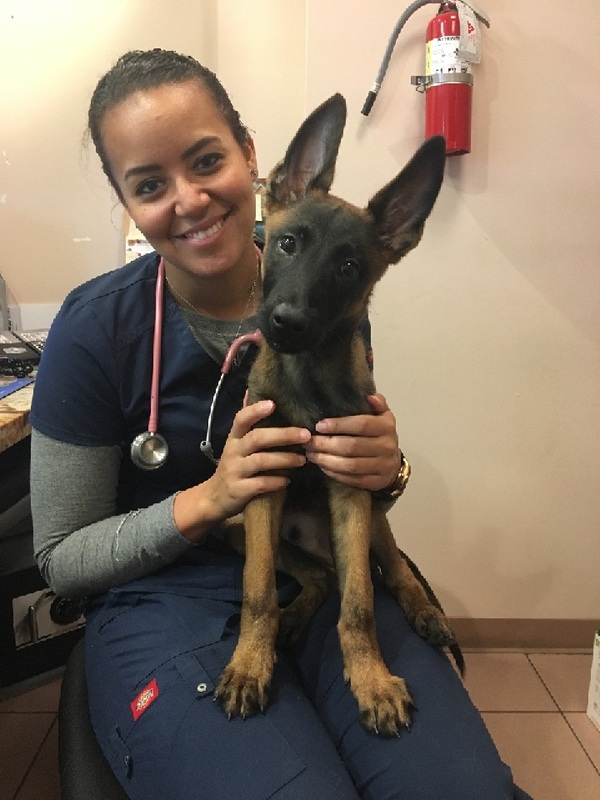 I was super nervous In the beginning with just being able to train a dog on my own but avisa gave me the best tips, advice, and confidence for the job that lied ahead. Now with chief being 1.5 years old and 90% of all training done by myself he really made me respect the breed even more. He is a prime example showing how the dog can be a loving compassionate lap dog at times, play and have a good time at the park, and when situations get serious do everything to make sure I am protected and no one harm me. After having chief I don’t think I will ever not have a malinois! I now am able to show chief off all over the country at horse shows and make more people aware and interested in the breed. This is all thanks to avisa k9 without them I would have never met my best friend and loyal companion! Thank you avisa k9 for all of your help!